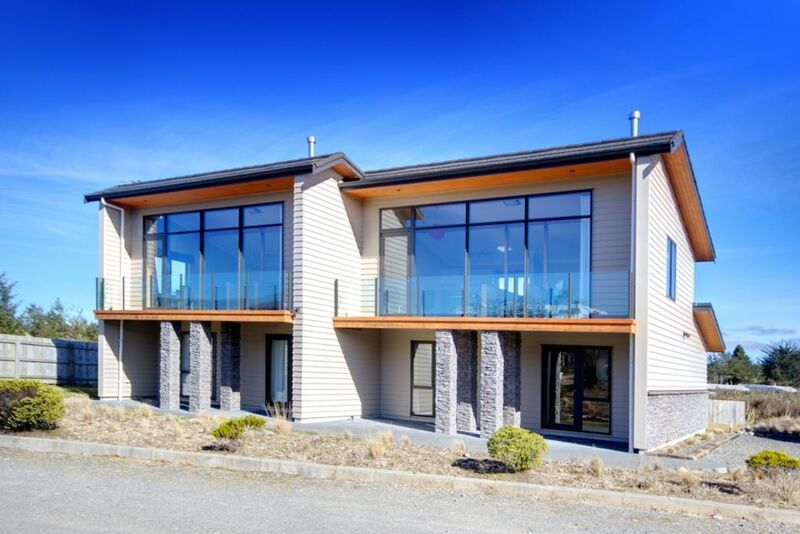 Parkview offers a modern, self-catering holiday home located close to Whakapapa Ski Area, Old Coach Road and Fishers Track Mountain Bike Trails, Tongariro Alpine Crossing, Chateau Tongariro Hotel and Department of Conservation Visitors Centre. Warm, comfortable, modern accommodation. Tokaanu Apartment as part of the Parkview Apartment complex is a 2 bedroom apartment that can accommodate up to four persons with different bedding configurations. The apartment is fully self-contained for maximum comfort. The Tokaanu Apartment inter-joins to the Waimarino Apartment for a maximum of 8 persons. This apartment is also listed on Bookabach. The bedrooms are on the lower level with king beds that split into singles. Separate ensuite with shower and bath, underfloor heating and mirror demister, separate toilet and separate laundry with washing machine and dryer. A heat pump is located downstairs. Enjoy expansive views from the upper level lounge/dining area to the east of Mt Ruapehu and the Tongariro National Park. The kitchen is fully equipped with a dishwasher, hob, oven, fridge/freezer and all utensils. The lounge has a gas fireplace, 32 inch flatscreen TV with satellite freeview and a DVD player. These apartments are the ideal modern and comfortable base for during your stay in the Ruapehu region. Parkview Apartments are within walking distance of the National Park Village convenience area including gas station and Macrocarpa Cafe and convenience store. Other restaurants are close by. Parkview apartments have been built to the highest quality and are priced to be affordable, comfortable and convenient. Linen optional. Towels or sheets not provided. $15.00 per bed per stay. Both King beds can be split into singles giving you a total of four beds. The default setting is one king in the master and two singles in the 2nd bedroom. Please advise if you want this configuration changed. 25 minutes to Whakapapa Ski Area. 45 minutes to Turoa Ski Area. A warm welcoming modern house in the middle of National Park village, walking distance to nearby shops, cafes, restaurants and shuttles. The house is well equipped with a gas heater, drying room and washing machine - perfect, and very much needed, after a wild Tongariro Crossing. Comfy beds too and well equipped kitchen - we had a great stay and would love to return again. Good location. Nice, warm and solid apartment. Very nice base to explore the Tongariro National Park and for the snow ski too! Would love to stay again! Recently built, extremely warm and well designed for a family stay. Recently built, extremely warm and well designed for a family stay. Just a minute's walk to the shop, cafe and ski-rental. A very pleasant stay in a comfortable, modern and well presented property. Very warm and comfortable. Outside main door a bit tricky when using key and inside door didn't work with code but did with key. No other issues. Very enjoyable.